"This information is largely drawn from the experiences Mr Sims of Verwood"
Note that this article was originally written in 1968 byh Mrs P Reeks. 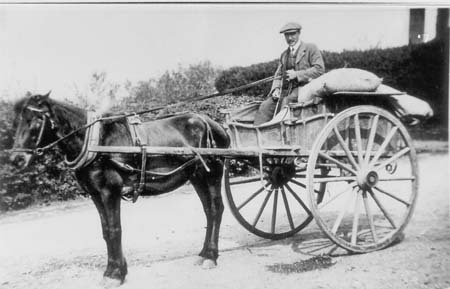 Mr Frederick G. Barrow with "Old Tom"
There were four forges in Verwood in the early 1900s, three of these combined smithery with the work of the wheelwright. The Ringwood Road forge was working again in 1967 and had been in use for at least one hundred and fifty years. It was there, that Mr. Percy Sims began his three year unindentured apprenticeship in 1912. He had always been interested in horses and smithery had been his ambition. To begin with he learned how to shut links of chains, which were used for traces and hauling. This is done infrequently today as chains are being replaced by wire rope. Another task he was allowed to do was pulling off horse shoes. The clenches (turned over nails) had to be cut off before the shoe was pulled off. Mr. Sims took ever the forge himself in 1927, and he told me that a frequent task at that time was repairing children's hoops. Girls had wooden hoops and boys had cast iron hoops two feat six inches to three feet in diameter, which were constantly breaking on the uneven gravel roads. This was a job that he did not like because it was difficult to weld the ends together as they sprung apart easily. He used to charge one penny for repairing a hoop. To weld two ends of metal, they had to be held together in the forge until they reached a certain temperature (judged only by an experienced eye) and then hammered together. If the metal was too hot, pieces of metal shattered and showered around the operator. Mr.Sims said that he did not use a flux, but the other village smiths used "welding plate" or silver sand from the local sand pit. 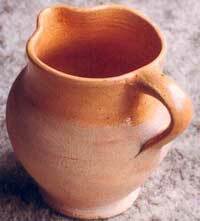 This was used as an abrasive, to prevent the ends which were joined from moving. Although there were three wheelwrights, smiths in the village, Mr. Sims made and repaired wheel tyres or bonds. The bonds were made three eighths of an inch to one inch smaller than the wheel and were shrunk onto it. To make a bond, a piece of flat iron of the appropriate dimensions was selected and laid flat on the ground, a chalk mark was made on the wheel rim and this mark placed on the end of the metal strip. The wheel was then rolled along the flat iron until the chalk mark was reached, twice the thickness of the iron was added and the iron cut at this point. The ends were then joined either by tapering them, frilling a hole and riveting the ends, or by dove tailing the joint. While the forging was taking place a wheel was screwed down to a platform which had a hole in it to accommodate the hub. When a bond was ready it was taken from the fire and dropped over the wheel. Sometimes the gap all round between the wheel and the bond was as much as half an inch. Mr. Sims then ran round the wheel pouring cold Water onto the bond, so that it shrank and made contact without burning the wheel. As no glue was used in making the wheel, the contracting bond pulled the wheel together. A sledge hammer was then used to force the ond flush with the wheel and to help bed the bond into the rim. Nails were driven through the bond into the wheel at every other spoke. Bonds eventually wore out and often during the summer months had to be "cut and shut" due to the drying out of the wooden wheel and the rough surfaces of the roads. Some of the village fold worked for the council. In the summer they "picked out" gravel from Boveridge heath to lay on the roads during the winter. Their pick-axes were "lained" or retipeed at the forge, as were the farmer's knife coulters. Hinges and hooks for gate fastenings were also made by the farrier. The hooks were made with long sharp points so that they could be driven into the gate post. The holes in the iron-work were punched, first from one side then the other side and then put over a hole in the anvil and punched out. Mr. Sims' greatest love was shoeing horses. 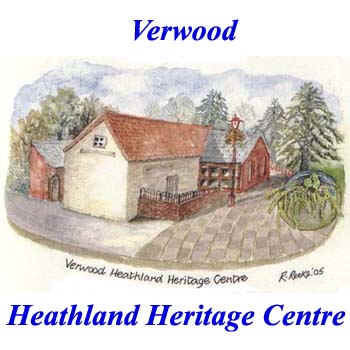 In the 1920s there were approximately two hundred horses in Verwood, today there are only about five. At one time Mr. Sims made shoes from iron bars, but eventually he bought ready made shoes, as iron bars were eighteen shillings per hundredweight. Old shoes were remade by turning them back (in half) using two turned shoes and making up the weight with additional metal. These were called "doubles" and were considered the best shoes. Shoe sizes varied from three' to eight inches across. Steel nails with a tapered head were used so that the head fitted into the hole in the shoe. The nails should not be put inside the white line of the hoof as This part is tender. It took Mr. Sim's approximately one and a half hours to shoe a horse. He used to go to outlying farms to shoe cart horses before breakfast. The forging was then done on coal, and he took ready made shoes, as he knew from previous visits which size a horse needed. He shod very few donkeys as "they were to small to get underneath". Mr. Sims spoke from experience when he said that the way to calm a nervous horse was to sing to it, though a spirited horse had to have a side-line fitted. This was a rope that was tied to the horse's fetlock, threaded trough its collar and tied back at at the fetlock. Holding its hoof up. He could work in this way without any mishaps. Against his will Mr Sims was forced into retirement in 1955. He had an invalid wife and he himself suffered with arthritic hips which prevented him "getting under" horses. Thus farriery is now part of Verwood' s history.